So now I’m stealing from my twitter account….I keep taking these god awful pictures on my dinky phone, but what the heck, I’m sharing them loud and proud now. I made this homemade pasta literally the night before I came to San Fran. Probably a good place to start? I think my mom wanted it to be a mother daughter distraction activity to draw her away from panicking that I left the east coast for three months. 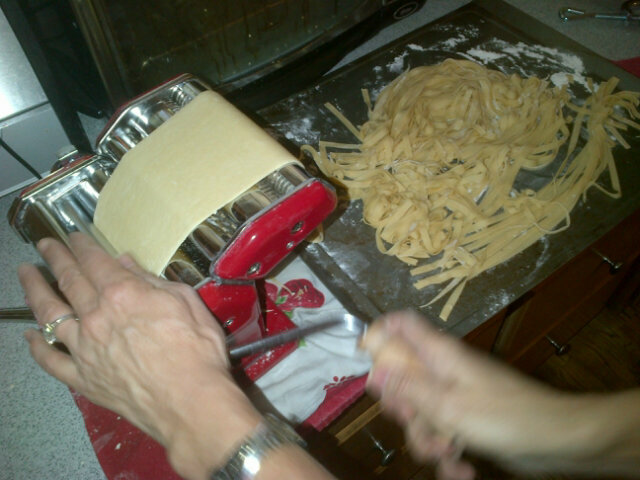 Thanks to my wonderful aunt Jessie, I now have a fancy pasta-making machine!!!! This beaut came from williams-sonoma and let me tell you, it weighs as much as an anvil. The recipe is incredibly simple and just involved lots of folding and rolling and re-rolling out dough. I think it’s something like two cups of flour and three eggs? You sort of form a volcano of flour and plop the eggs in the middle, gently whisking the eggs in bit by bit. We cut out pasta, threw it in some boiling water for 2-3 mins and added it to some fabulous white wine garlic clam sauce. A mama mia!